This is the most common issue, that you have deleted some important files from your system, that you didnt actually want to. Don't get nerves in such situation, coz It is easy to recover deleted files. You can undelete files with almost guaranteed success. The most important thing is to act as soon as you realize that the files are lost. Because the operating system doesn't immediately re-use space from deleted files, a file can be recovered or unerased right after it has gone and for a considerable time afterwards. 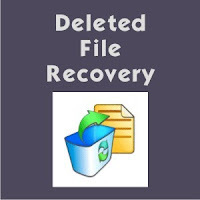 The sooner you try to recover your deleted files, the greater your chances of success. The longer you leave it the less chance you have of getting the data back because eventually some or all of the space that held your lost data will be re-used by another file. The chances of recovery also depend on how full your computer's hard drive is. Windows tries to avoid re-using disk space that has recently been freed, to give recovery software a better chance of working. But the fuller a drive is, the sooner the free space is going to be used by other files. If you have defragmented the hard drive since the file was deleted then this will severely harm the chances of a successful recovery. Current files will have been moved into the free space left by deleted files in order to reduce fragmentation, making it much less likely that undelete software will be able to find anything useful. Data recovery is very easy and almost same for any of the above listed software. First, the program will detect the deleted data that can be restored, and then in next step it will save the files you select to restore. Here, I am telling the procedure for Undelete360 from the above list to give you an idea that how it works. Undelete 360 is one of the best Freeware software to restore your files that were accidentally deleted from your computer. 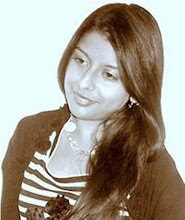 It is built on fast and efficient algorithm that browse, search and recover files lost due to a different factors like accidental deleting, viruses, software and computer failures. Its the easiest software to use. Using Undelete 360, you can restore files from Hard drives, Digital cameras, Floppy drives, USB flash drives. 1. Download and install desktop version of Undelete360, or you can use portable version also. 2. 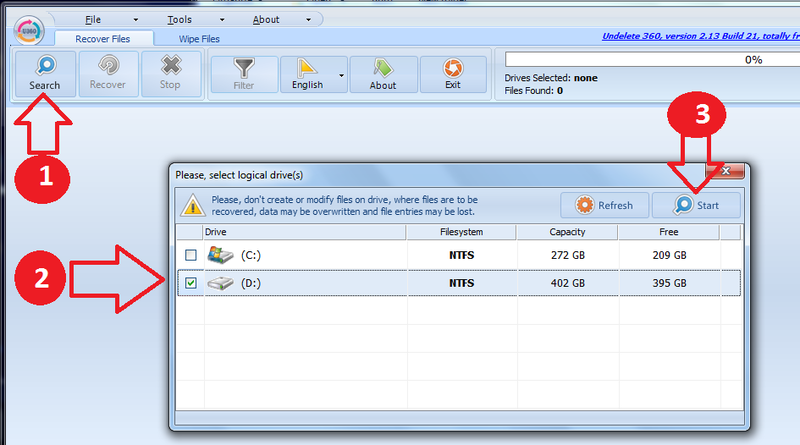 Now open Undelete360, click on Search botton >> select the drive for which you want to recover deleted data >> click on start. Then you will see the process bar at top right, which shows the the number of files found and proportion of search remaining. 3. After complete processing of finding deleted data, you will see files grouped by file type in the left hand column, you can check file name and location and can select the files you want to restore. Check out other posts under category Computer Tips. Recovery of data has been made simpler by using Remo Data Recovery tool. Most of the people accidentally delete data by using "Shift+Delete" key or by emptying files from recycle bin. The software can identify and recover all popular photo, audio, video and digital RAW photo files with ease. Download the free version of the software and check for the recovery results.